Protect rooftop HVAC equipment and commercial filters from increasingly frequent hailstorms. Weather and climate-related insurance losses have more than doubled every decade since the 1980s. Reports of 2-inch hail have increased by a factor of 5 since the 1950’s and doubled since the early 2000’s, with similar increases reported for hailstorms overall. Even small hail can damage rooftop HVAC equipment including by bending and denting air intake fins, which in turn blocks air flow and reduces operating efficiency. And larger hail can cause much more severe and costly damage. BUILDINGS magazine selected HailStop® Hail Guard Netting as an HVAC Fix – 2015 Money-Saving Product winner. HailStop Hail Guard Netting is part of an elite group of products showcased in the magazine’s June 2015 issue. HailStop Hail Guard Netting is made of a rigid black polypropylene with diamond shaped openings. The netting is lightweight and extremely easy to install. HailStop can easily be cut to fit using scissors or a utility knife. HailStop hail guard netting can be easily installed using Permatron’s plastic mounting kit. The plastic holding clips have a moveable/locking tab that opens and closes for secure installation and easy removal and cleaning. The plastic mount clips come in two height sizes so that outdoor air intakes and equipment can be protected using both HailStop and PreVent filter screens. Model HailStop50 is sold in master rolls 54″ wide x 50 foot length. 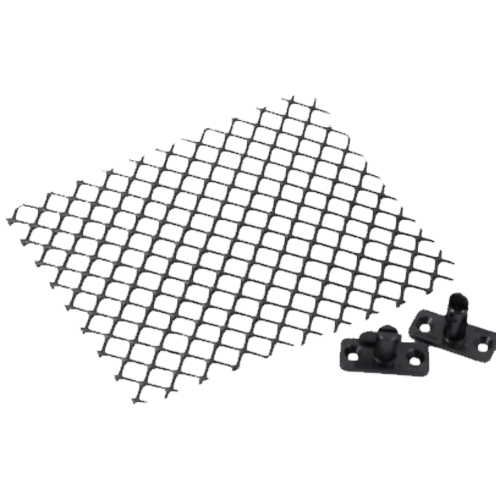 Model HailStop10 is an easier to handle service pack for jobs up to 10 tons, and includes a package of 12 single height mount clips with screws. Model HailStop20 is an easier to handle service pack for jobs up to 20 tons, and includes two packages containing 24 single height mount clips with screws and 12 zip ties to secure netting panels side-by-side. HailStop hail guard netting is an economical retrofit solution to protect your HVAC equipment air intake fin from getting smashed during the next hail storm.